The fossil was collected in Ventabren in France - and dates from the Cretaceous - approximately 68 Million Years Ago. 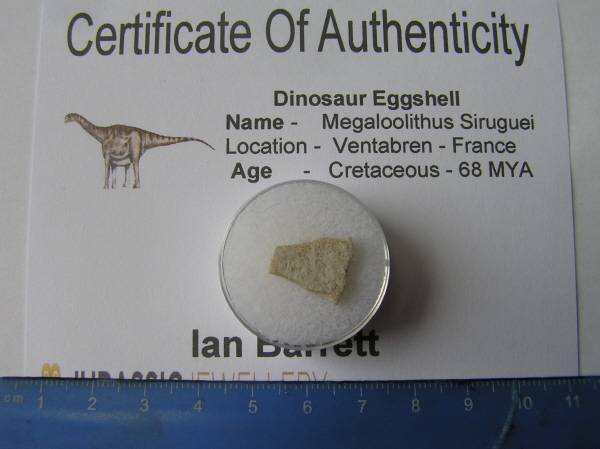 One issue with Megaloolithus Siruguei shell is that the the Dinosaur it came from is largely unknown. We know it was a Sauropod, but the dinosaur itself has never been discovered - which makes it's appearance and lifestyle a bit of a mystery! This is a more rare fossil to find and this is the first I have ever offered in more than 12 years of selling fossils on Ebay. This material really is rare - and I challenge you to find more than a handful of other sellers on Ebay! The piece of shell measures 1.5cm across.